Berkshire Healthcare NHS Foundation Trust CAMHS manages the Autism Assessment Pathway, which assesses whether a child or young person has an autism spectrum condition. Click here for full details of the Pathway process and the Trust’s Autism Assessment Team. The waiting list for an assessment is about 18 months (as of mid-2017). Parents and carers are welcome to attend one of our pre-assessment workshops once their child has been accepted on the CAMHS waiting list. 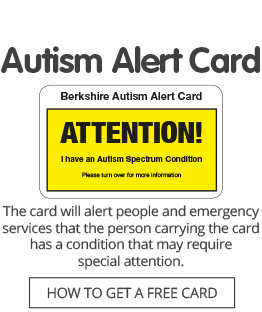 If you have concerns that a child may have autism, speak to your GP, health visitor or, if the child is attending school, a teacher, who will be able to refer you for further advice. If your child is on the Berkshire CAMHS waiting list for an autism assessment appointment, you can attend our NAS Autism Seminars for Families, which provide practical advice and strategies to use while you wait. These workshops are free of charge to participants, thanks to funding from the Berkshire NHS clinical commissioning groups. Click here for more details of these workshops and other pre-assessment support we offer to parents and carers. The wait for assessment in January 2016 was about eight months. We do not recommend private diagnosis but if you decide to follow this course, there are a number of local private providers. Please make sure that you consult someone who is registered with the Health and Care Professions Council (HCPC). The centre offers diagnostic services for individuals following evidence-based practice, with assessment carried out by a specialist clinical psychologist and speech and language therapist and follow-up support as required. Assessments may be privately funded or through employing organisations. Assessment fees in May 2017 were £800 for under-18s and £1,000 for adults. Click here for more details or call 0118 378 7558. Please note that due to a high level of demand, the Centre for Autism is not currently taking any further referrals for autism assessment appointments. See their website for details. Every Mind provides diagnostic assessments, ongoing support and therapy for children under 18 years. Dr Dawes has lots of experience in autism diagnosis of children, including working at Prof Tony Attwood and Dr Michelle Garnett’s diagnostic clinic in Australia. Every Mind diagnostic assessments are comprehensive and follow best practice. Prices start at £1,500. Every Mind’s clinic is in Spencers Wood, just south of Reading. Chartered Psychologist Anne Jeavons, who has many years of experience assessing adults for autism spectrum conditions and/or ADHD in the NHS and privately, offers assessment services at the Therapy Centre in Church Street, Reading. Assessment appointments cost £650. For more details and to arrange appointments, email anne.jeavons@gmail.com or call 07801 264489. Oxford ADHD Centre in Headington provides autism and ADHD diagnostic services for children and adults, as well as a neurodevelopmental assessments for children who may have more complex difficulties. Autism assessment fees in October 2017 were £1,500 per person. See www.oxfordadhdcentre.co.uk or call 01865 744144. Among the team at the Oxford centre is clinical psychologist Dr Mandy Smiton, who also has her own clinic in Wallingford, Oxfordshire, and sees clients from Berkshire. She specialises in working with children and adolescents. See www.drmandy.co.uk or call 07591 684918. Based in Woodley. Assessments carried out by Dr Jenny Murray. See www.berkshirepsychology.co.uk for details or call 07894 353141. Based in Basingstoke, Dr Thomas-Bawa is a chartered clinical psychologist. See http://assessyou.com/ or call 01256 405460. Clinical Partners provides autism and ADHD assessments for adults and children at a number of locations across the UK, including Oxford, Farnham and London. Assessments are carried out by psychiatrists and psychologists who have undergone specialist training. The fee in August 2018 was £2,300. See https://www.clinical-partners.co.uk or call 0203 326 9160 for more details of its services.